I have been missing him so much. My longing for him came out of nowhere. I thought I had conquered our divorce and yet memories of the good times crept up on me the other evening. I cried myself to sleep thinking about how much love we had between us. I am still in shock and disbelief that we walked away from 13 years of marriage. When I give my heart away, I love so hard and I am so loyal. Even now, I find myself traversing the single life but longing to be with just him. And yet I know that he and I will never be again. I am trying, with much difficulty, to even want to be single again. Dating and getting to know new people is difficult when I have come from a relationship that was laden with trust, respect, and love (minus the year before we divorced). My dear father has been priceless in my transition from married woman to single. He is so wise even though he is a man of very few words. I can hear what he doesn't say based on his reactions to my ramblings. He reassures me that I made my ex a better man. I stood by him when he deployed to the Middle East. I wrote him every single day and sent him care packages the whole time. That's my duty as a wife, right? No one else wrote him. When we parted, I took all those letters back. Those are my words. I stood by him when he was doing battle with the U.S. Army. I tap danced to his beat; whatever he needed me to do I did without questioning him. When he finally separated from the military, he wanted to move to Hawaii and I wanted to move to Georgia. Guess where we went? Hawaii. I assisted him through his Bachelor and Masters Degrees. I take no credit for the work he did -- it was ALL him but I do acknowledge that I stood by him through it. Why does a man walk away from a woman so loyal? Maybe I'm a little too "alpha" for him. Did my behavior or actions emasculate him in some way? I don't know. I will never know. What I do know is that I cried myself to sleep the other night just missing his presence. His beauty. His strength. His quiet confidence. His warm body next to mine. I tear up when I think of all the beautiful things he was to me. I don't know what I did wrong and it messes with me because he is the second man to leave me. It stirs up old feelings of inadequacy that happened with my first marriage. And I, for the life of me, cannot figure out where I am going wrong in a marriage. I don't want to be bitter. 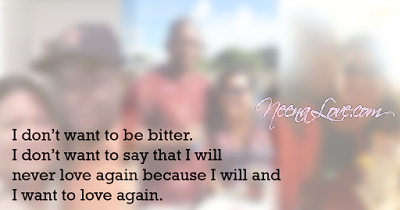 I don't want to say that I will never love again because I will and I want to love again. What I don't want is to take any of my current baggage from both marriages into new love. Perhaps I am much stronger than I was before my heart was shattered... twice. But maybe I'm way more cautious or suspect of men who desire my attention and affection. I don't want to be that bitter girl that questions a man's intentions toward me. And maybe some are just getting at me to be a convenient physical companion and that's okay, I suppose. But my body is just the bonus because my real value is in my soft heart, my ever-curious mind, and my deep-seated soul. Maybe some will dig and stick around long enough to explore me but most will not. Yet I will remain who I am and become the best me in every single moment. As I traverse single life, I want to proceed with wild abandon. Even though I miss him and the memory of our love crosses my mind often, I have to look forward to new love and new relationships. God willing, it will be a love so magical and filled with genuine and sincere affection that it will transcend lifetimes.I would have never chosen to split from someone that I had spent so much of my years with. If it were up to me, I would have remained loyal to him all the days of my life. True love is a gift.